Guava easyCyte: s/n GTI-96-3-120278: 3-color with 488nm diode-pumped laser. Viacount plus 9 other assays. 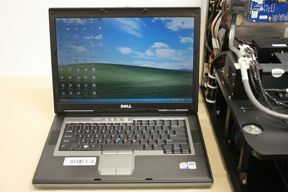 Workstation: Dell® computer running Windows. Assays: Guava ViaCount, ExpressPlus, Nexin, Caspase, MitoPotential, TUNEL, Cell Cycle, CellPaint, CellToxicity and CellGrowth. YLW), 680/30 nm (PM2/RED), and 525/30 nm (PM3/GRN). 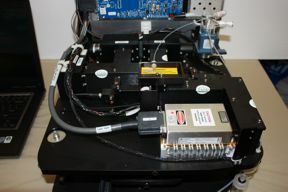 Sample Flow Rate: 7 μL/min to 35 μL/min with final particle concentration of 104 to 5 x 105 particles/mL for accurate results. 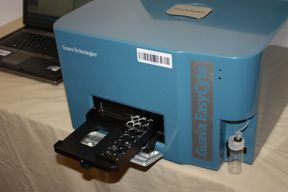 Multiwell Sampler: Requires specific types of 96-well plates. Analyzer Dimensions/weight: 16" wide x 22.5" deep x 13" high. 70 lbs. This easyCyte has all of the assays available from Millipore. No other options are available. 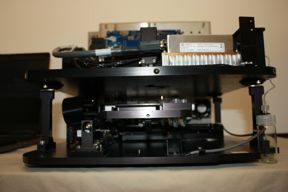 All components have been refurbished or replaced as required to like-new appearance and operation. Final Guava check beads will confirm operation and alignment within factory specifications prior to shipping. Final histograms will be provided to prospective purchaser. Installation by a qualified service representative quoted separately. The price will include all travel expenses and labor required to confirm proper operation at the customer's facility utilizing standard calibration procedures. Any additional time required to correct malfunctions shall be included in the quoted installation fee. Instrument and/or applications training by a qualified representative are available for an additional fee. The quoted price includes travel and perdiem expenses when training is performed during an installation visit. Otherwise additional reimbursement for travel and perdiem expenses may be required. Custom warranty or service contracts can be quoted separately. All components are covered unless failure is due to operator negligence. In addition, we offer unlimited telephone support for all of the products sold through Spectron Corporation regardless of warranty. Shipping costs will be quoted separately. If the purchaser becomes the shipping agent for one of the products located in the State of Washington they could be subject to paying Washington State sales tax unless exempt. No such obligation exists if Spectron Corporation is the designated shipper to destinations outside the State of Washington. This equipment shall be packed in a sturdy double-walled box surrounded inside by 2" foam sheets on all sides. All components shall be individually protected within the same container. The box will be taped, strapped and attached to a pallet with additional strapping. Shipping will be arranged through a qualified airfreight carrier with full insurance. Most established institutions will be approved for net-30 terms or other payment plans. Leasing or rental programs may also be available for qualified buyers with various options for an eventual purchase. Washington State customers or others arranging shipment or picking up products themselves may be subject to Washington State sales tax unless exempt. Spectron Corporation will inform prospective buyers of any such circumstance that could result in a tax liability. Otherwise, buyers would only be subject to applicable use taxes that they might be required to pay directly to their respective state. 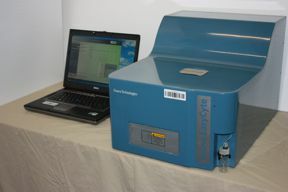 Spectron Corporation would appreciate the opportunity to bid on a service contract covering our products as well as other flow cytometers located at your facility. Please inquire into any modifications to the listed products that would better suit your requirements. We strive for complete satisfaction.